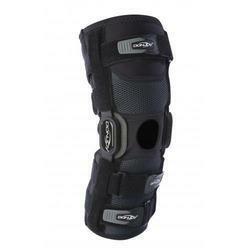 Our product range includes a wide range of donjoy oa knee brace, donjoy acl brace, donjoy web reaction knee brace, patella knee brace, post op ankle brace and post op knee brace. Donjoy Sports Knee Brace is the ideal "first-time" choice to allow patients to get accustomed to wearing a brace, making it easier to transition into a more rigid OA brace. OA Web Reaction is also a good option for patients wishing to use it as lighter alternative to thier usual rigid brace. The light weight, low-profile design allows the brace to easily be worn as a discreet pain relief solution before, during or after activity. 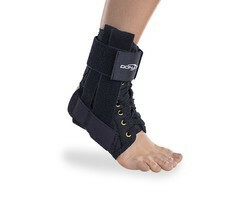 Four way, adjustable wrap around design makes the brace comfortable to wear & easy to apply. 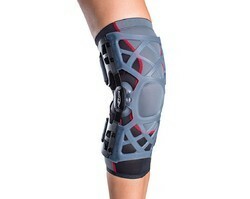 Donjoy Playmaker II brae is best for patients suffering from ACL, MCL & LCL Ligamanet injury, tear and/or Instability. Its cooler fabric is made for humid country like India. It avoids alergy and humidity inside the brace. Donjoy OA Reaction Web Knee Brace - Medial Left / Lateral Right is ideal for those suffering from the early stages of osteoarthritis (OA) and chronic knee pain. It is designed to off set pressure and support the patella, the brace uses medical grade silicon which has been anatomically designed to extend and retract with various leg movements. Comfortable silicone webbing provides shock absorption and anterior knee pain relief. It is ideal for early to mild unicompartmental osteoarthritis of the knee and patella. It is the ideal first time choice; it allows patients to get accustomed to wearing a brace, making it easier to transition into a more rigid OA brace when the time comes. The brace is also a good option for patients wishing to use it as a lighter alternative to their usual rigid brace. The easy to wear open framework is designed for a comfortable, non slip fit. With a firm commitment towards quality, we have been able to offer a comprehensive assortment of Patella Knee Brace. Widely use for acute mild to moderate anterior knee pain, its patented dual durometer buttress system offers reliable corrective force on patella. 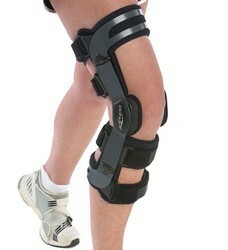 This brace is designed using advanced technology in adherence to the set market norms at the vendor's end. In addition to this, this brace is delivered within the promised time frame to our customers at market leading price. Being the leaders in the industry, we offer high grade AirSport Ankle Brace to our clients. Being the leaders in the industry, we offer high-grade Post OP Knee Brace to our clients. 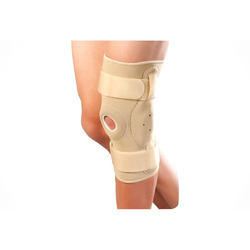 We are considered as the well-recognized suppliers and traders of Post Operation Knee Brace. 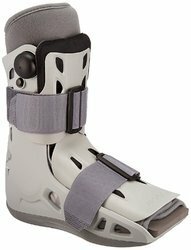 Being the leaders in the industry, we offer high-grade Air Cast Air Sport Ankle Brace to our clients. Donjoy SE 4PT ACL Knee Brace For Right Leg & Left Leg is the most comfortable, easiest to use, lightest, patient ready knee brace and is ideally suited for non contact sports and activities of daily living. So if you have mild ACL (anterior cruciate ligament) /MCL/LCL instabilities and are looking for comfortable support for the activities of daily living, or non-contact sports, go for Donjoy SE 4PT ACL Knee Brace and never stop getting better. It is constructed from strong, aircraft grade aluminum. This knee support brace is coated with Kraton, a substance that does not chip, rust, or corrode; so it is also safe for salt and fresh water activities. The straps are made from nylon, heavy elastic, and velcro which provide a secure fit. Dual Stabilizers restricts wrist movement while permitting full finger functions. Adjustable Straps & Three sizes ensures personalized fit. Contoures Shape & breathable fabric promote comfort. Available with Thumb Spica to hold thumb securely in place. Wrist Injur (Ligamanet instability, sprain or muscle pain. Post-removal of casting or splint. The Contour is designed to fit specifically the right or left leg, and can be ordered in either a long or short model. The Universal model is standard to fit both left and right. Both are available with breathable “Air Light” padding or tissue controlling “Full Foam”. Donjoy Brace is a unique and effective way to treat osteoarthritis knee pain utilizing patented silicone web technology. The easy to wear open framework is designed for a comfortable, non-slip fit. Silicone web technology for soft, comfortable support. Patented silicone web design to provide shock absorption and mild offload. 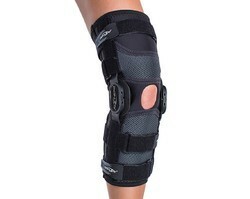 Knee Brace For Meniscus Injury Knee Brace - Medial Left / Lateral Right is ideal for those suffering from the early stages of osteoarthritis (OA) and chronic knee pain. It is designed to off set pressure and support the patella, the brace uses medical grade silicon which has been anatomically designed to extend and retract with various leg movements. Comfortable silicone webbing provides shock absorption and anterior knee pain relief. It is ideal for early to mild unicompartmental osteoarthritis of the knee and patella. It is the ideal first time choice; it allows patients to get accustomed to wearing a brace, making it easier to transition into a more rigid OA brace when the time comes. The brace is also a good option for patients wishing to use it as a lighter alternative to their usual rigid brace. The easy to wear open framework is designed for a comfortable, non slip fit. 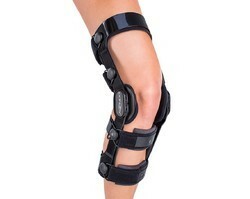 We are remarkable enterprise, involved in offering superior quality Knee Brace.